NOTE! It is important to slide the device STRAIGHT DOWNWARD into the holder, and to slide it STRAIGHT UPWARD out of the holder. This holder for cable attachment can, combined with an Apple cable, be used for charging your iPhone. 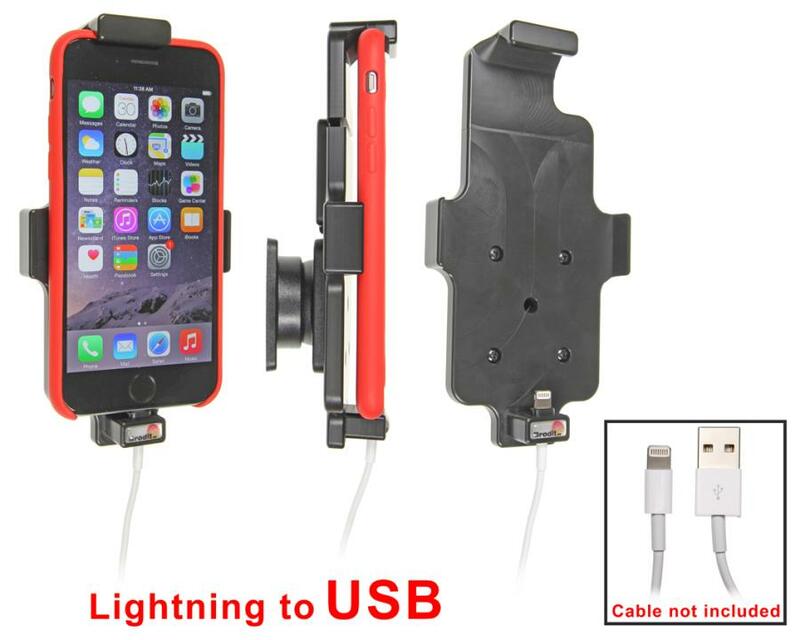 First you mount the cable into place onto the holder, then it connects automatically to your iPhone every time you place the device in the holder. 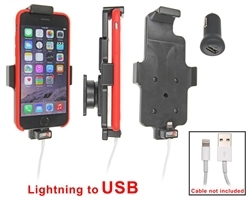 You can charge you iPhone by connecting it to the car’s USB socket, or use it with a USB/cig-plug adapter for the car’s 12V socket. Important: Cable not included.The cable attachment holder can be combined with Apple original Lightning to USB Cable. There are two sizes of cables depending on when you purchased your iPhone (Apple article. no. MD818ZM/A and MD818AM/A), the cable attachment block fits them both. To use the holder, you first set the width to fit for your skin, then you can easily place your iPhone in the holder. 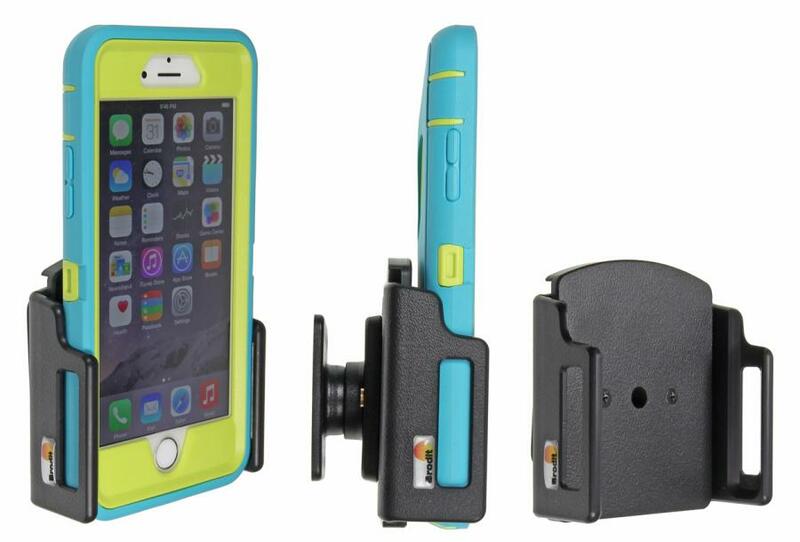 Fits devices with slim sized skins that has the following dimensions: Width: 62-77 mm, Thickness: 2-10 mm. (May fit for skins thicker than 10 mm, depending on shape/design of the edges). The holder is made of ABS plastic and is padded. This means it has a plush coating which is extra protective for your device. The holder has a perfect fit. 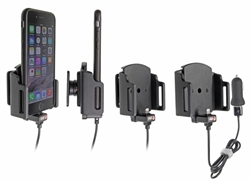 It is easy to put the device into the holder, and just as easy to take it with you when leaving the vehicle. The holder fits for iPhone without skin. 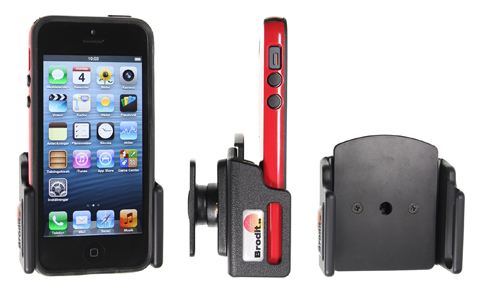 The holder is equipped with a tilt swivel. It means you can easily adjust the angle or your device in order to avoid light reflection on the screen. It also allows you to switch between portrait and landscape mode in a second. 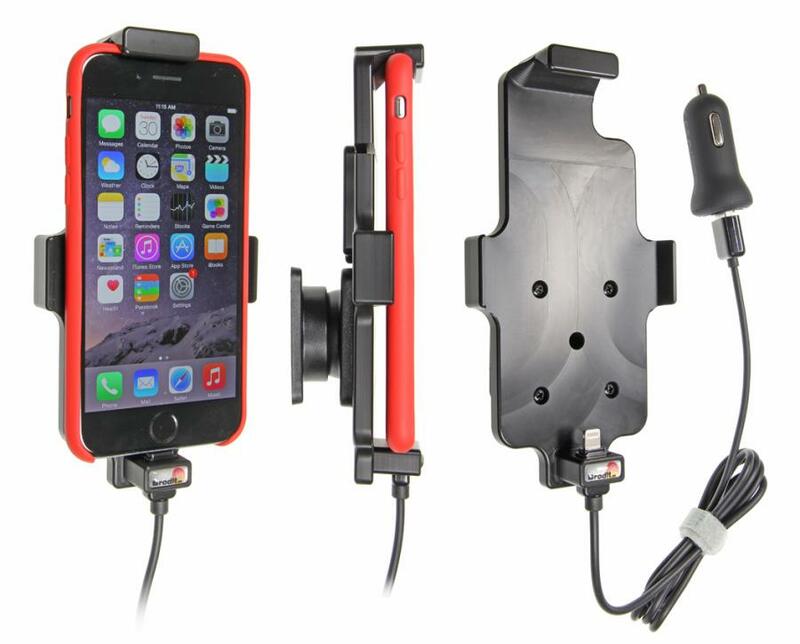 Attach onto ProClip mounting platform and you will always have your iPhone within easy sight and reach while on the road. 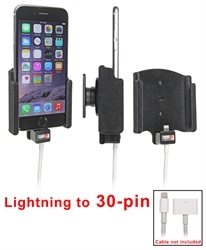 For use with Apple original Lightning to 30-pin Adapter Cable. Adjustable holder. Fits devices with skin that has the following dimensions: Width: 62-77 mm, Thickness: 2-10 mm. 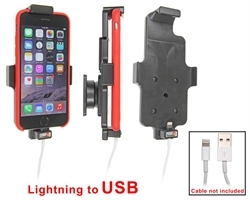 This holder for cable attachment can, combined with an Apple cable, be used for charging your iPhone. 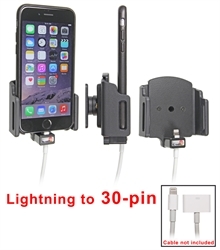 First you mount the cable into place onto the holder, then it automatically connects to your iPhone every time you place the device in the holder. 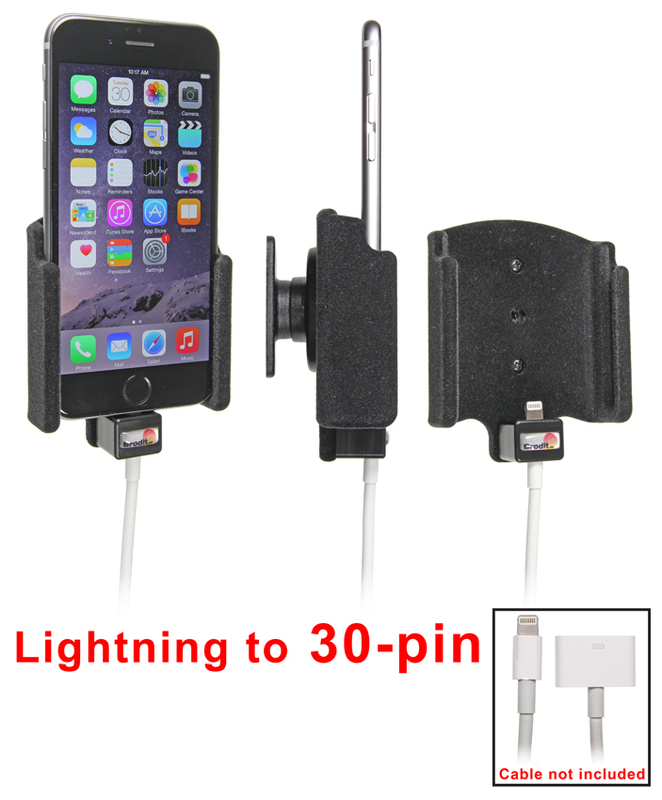 The cable attachment holder can be combined with Apple original Lightning to 30-pin Adapter Cable (Apple article. no. MD824ZM/A. Keep your iPhone in a passive holder on the road and you will always have it within easy sight and reach. Safe, comfortable and convenient! The holder has a neat and discreet design which blends well with the vehicle's interior. Your iPhone is held securely in place in an upright position for maximum cellular reception. You can connect an Apple Lightning cable and a headset to your iPhone while placed in the holder. In order to find the correct holder for your skin: Measure your skin and compare with the dimensions for each holder. 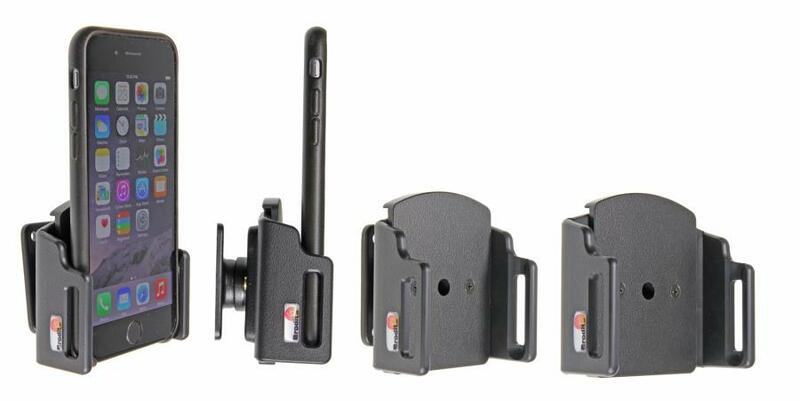 To use the holder, you first set the width to fit for your skin, then you can easily place your iPhone in the holder. Fits devices with skin that has the following dimensions: Width: 75-89 mm, Thickness: 9-13 mm. (May fit for skins thicker than 13 mm, depending on shape/design of the edges). 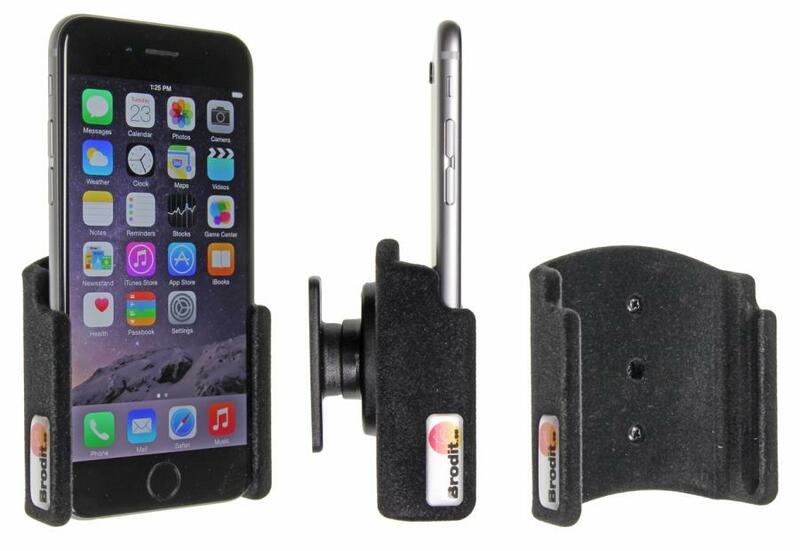 Keep your iPhone in a passive holder on the road and you will always have it within easy sight and reach. Safe, comfortable and convenient! The holder has a neat and discreet design which blends well with the vehicle's interior. The iPhone is held securely in place in an upright position for maximum cellular reception. You can connect e.g. a portable handsfree or a charging cable to the device when it is in place in the holder. Adjustable holder. Fits devices with skin that has the following dimensions: Width: 62-77 mm, Thickness: 6-10 mm. Fits devices with "standard" sized skins (not rugged or slim size). Fits devices with skin that has the following dimensions: Width: 62-77 mm, Thickness: 6-10 mm. (May fit for skins thicker than 10 mm, depending on shape/design of the edges). 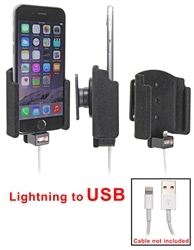 Use an active holder for your iPhone on the road and you will always have a freshly charged battery! In addition, you will always have your iPhone within easy sight and reach. Safe, comfortable and convenient! The active holder is to be connected inside the dashboard. It provides an elegant installation without any cables hanging over the interior. The holder has a neat and discreet design which blends well with the vehicle's interior. Your iPhone is held securely in place in an upright position for maximum cellular reception. When you place the iPhone in the holder, it automatically connects to the charging unit. 12 Volt. The product is E-approved. Connect the power cable with a 2 A fuse. Professional installation recommended. Length of charging cable: 123 cm. The holder is made of ABS plastic and has a perfect fit. 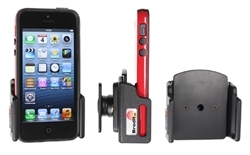 It is easy to put the device into the holder, and just as easy to take it with you when leaving the vehicle. 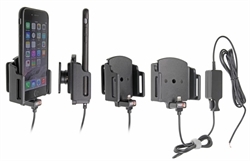 Fits devices with skin that has the following dimensions: Height: 137-144 mm, Width: 75 mm, Thickness: 2-11 mm. (May fit for skins thicker than 11 mm, depending on shape/design of the edges). The holder is equipped with a tilt swivel. It means you can easily adjust the angle or your device in order to avoid light reflection on the screen. It also allows you to switch between portrait and landscape mode in a second. Made of black Acetal plastic. The holder is pattern protected. Attach onto ProClip mounting platform and you will always have your iPhone within easy sight and reach while on the road. 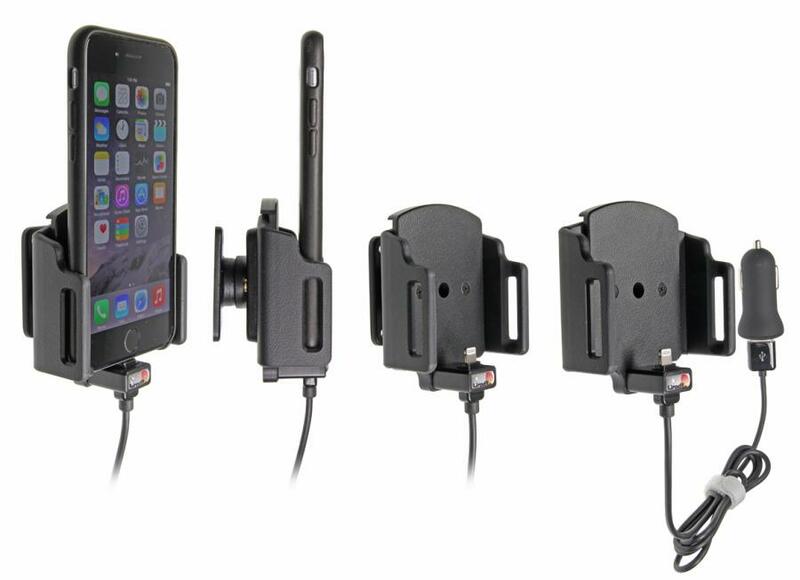 Use an active holder for your iPhone on the road and you will always have a freshly charged battery! In addition, you will always have your device within easy sight and reach. Safe, comfortable and convenient! The holder has a neat and discreet design which blends well with the vehicle's interior. Your device is held securely in place in an upright position for maximum cellular reception. The holder is equipped with an Apple approved cig-plug cable for connection to the vehicle's 12 Volt socket. 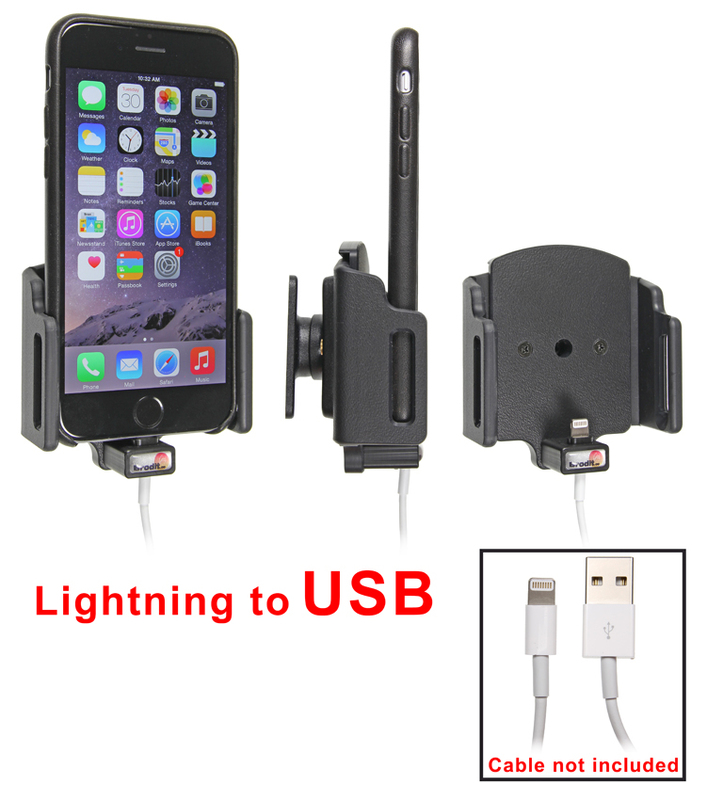 When you place the device in the holder, it automatically connects to the charging unit. If you have a car with USB interface, you can disconnect the cig-plug from the holder's cable in order to get a USB-cable to connect directly to the USB connector in your vehicle. The holder is made of Acetal plastic and has a perfect fit. It is easy to put the device into the holder, and just as easy to take it with you when leaving the vehicle. 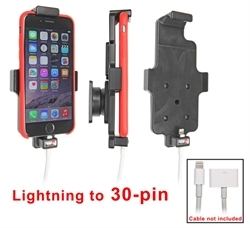 The cable attachment holder can be combined with Apple original Lightning to 30-pin Adapter Cable (Apple article. no. MD824ZM/A). 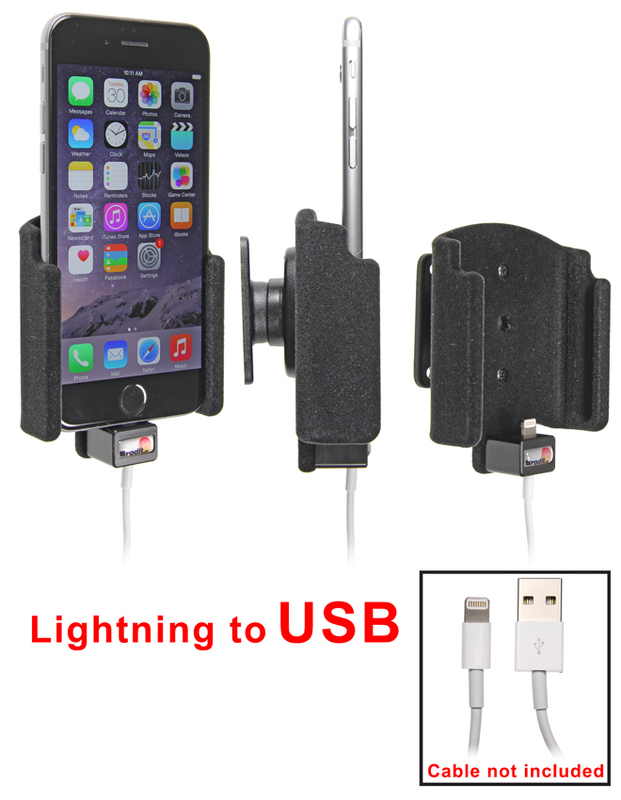 Use an active holder for your iPhone on the road and you will always have a freshly charged battery! In addition, you will always have your iPhone within easy sight and reach. Safe, comfortable and convenient! The holder has a neat and discreet design which blends well with the vehicle's interior. The iPhone is held securely in place in an upright position for maximum cellular reception. The holder is made of ABS plastic and is padded. This means it has a plush coating which is extra protective for your device. The holder has a perfect fit. 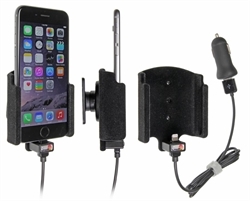 It is easy to put the device into the holder, and just as easy to take it with you when leaving the vehicle. For Apple original Lightning to USB Cable. With tilt swivel, Griffin USB/cig-plug. 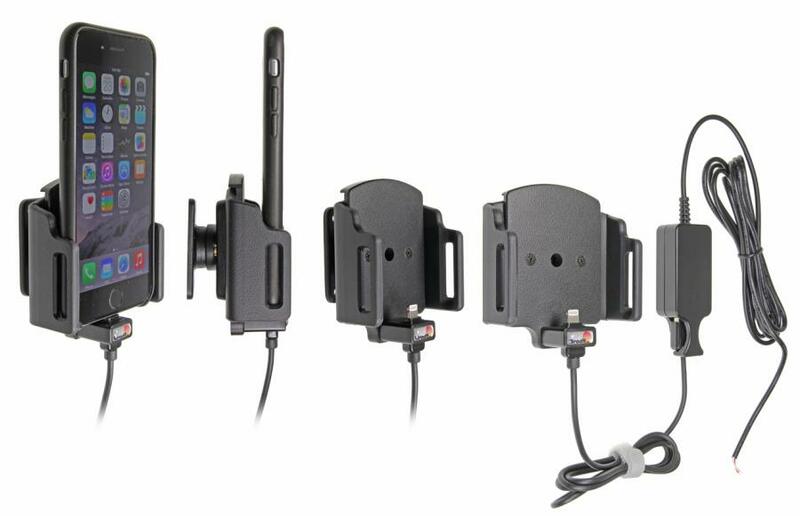 Fits devices with skin that has the following dimensions: Height: 137-144 mm, Width: 75 mm, Thickness: 2-11 mm.